This Pomegranate Beet Recovery Juice is great both before and after your work-out or when you need just that little bit of extra energy. It also tastes delicious in this mix with pomegranate, lemon and coconut juice. Research into the benefits of beet juice have showed that drinking beet root juice before your work-out can reduce the amount of oxygen you need to perform as an athlete. As such it is an effective pre-workout energiser and can boost your performance. As it makes your muscles work more efficiently, it can even help to increase your endurance and reduce post-workout fatigue.It’s not just great to boost performance before your workout, it makes a great recovery drink too as it high in antioxidants and essential vitamins and minerals. I usually have this drink after a long work-out. Read more about the effects of beets on athletic performance here or here. Juice the beet and lemon. 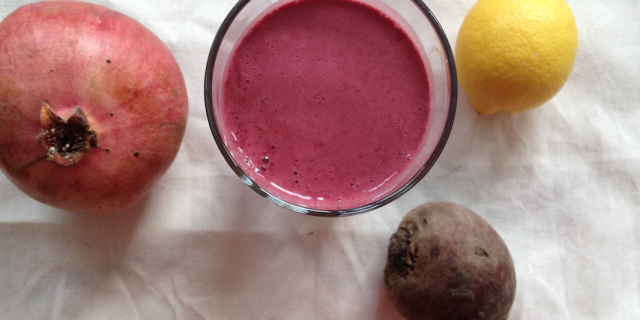 Stir in coconut water and pomegranate juice and enjoy your home-made Pomegranate Beet Recovery Juice!